The second edition of this popular textbook provides readers with a foundation in methods for analysing and understanding language from various theoretical perspectives within linguistics and language studies. Its novel approach introduces systemic functional linguistics, text and discourse analysis, and formal approaches to linguistics. It demonstrates applications of these approaches to reveal how we use language in society, how our brains process language, and how we learn language. The main language focused on is English, while other languages are also drawn on to illustrate the principles, models and theories. Learning outcomes, exercises (with answer key), ideas for project work, and questions for reflection are provided throughout. A final chapter gathers explanations of various fields of practice within linguistics, written by linguists from around the world. The second edition includes added explanations, examples and exercises, updated references and web links and an expanded number of entries in the glossary. It also provides a new configuration of the material related to syntax and lexico-grammar, giving readers the opportunity to see more clearly the contrasts between formal and functional analyses and to understand the differences in these views of language, leading to a stronger grasp of how language ‘works’ within the brain and within society. It includes new material on analysing texts for interpersonal and evaluative meanings, and on analysing multimodal texts for meaning provided from combinations of verbal language and visual modes, providing an increased range of text and discourse analytical tools. This innovative blend of textbook, workbook, and anthology is a welcome addition to the introductory linguistics literature. Anne McCabe presents an enormously appealing, accessible, and up to date treatment of the field to those who always wanted to know what it was all about — but, perhaps, were afraid to ask! 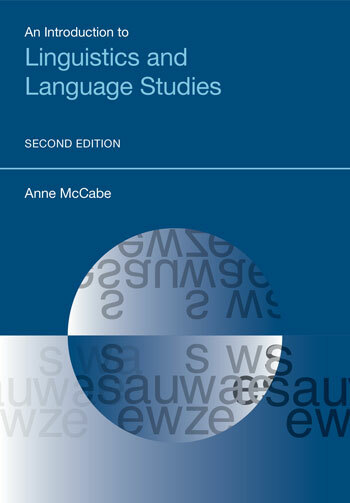 McCabe provides novices to the linguistics community with a well-written and highly interactive text that allows readers with various levels of pre-existing knowledge to explore both the theoretical and practical applications of linguistics and language studies across many topics. This book is very ambitious, and it is also very well-written. It covers just about any introductory topic one could imagine in the study of language, and it is an excellent survey of the field(s). McCabe has a gift of writing in an accessible way, even in areas (such as generative grammar or SFL) that are typically hard to grasp. The exercises throughout the book are genius—any teacher in these fields could benefit from the practice and discussion opportunities they provide students. Furthermore, she peppers the chapters liberally with these exercises, so the reader (or student) has a chance to apply their knowledge during and after each new topic is presented. The suggested readings at the end of each chapter (and at the end of each section in Chapter 9) are a gift, and the glossary is comprehensive, with clearly written definitions linked back to the bolded terms throughout the book. A highlight of this book for me is McCabe’s treatment of Chomsky’s and Halliday’s theories; it often seems to me that scholars are divided as to whose camp they are in, but McCabe doesn’t take sides here. Rather, she presents each theory without apparent bias, and her reference list in this chapter is rich and balanced. I can envision this text as being useful in a graduate survey class (or fourth-year undergraduate class, perhaps). Furthermore, it is an excellent reference book and one I can imagine myself returning to often. Not only does McCabe incorporate both language studies and linguistics in one book, but she also goes back and forth between theory and method seamlessly and in an orderly manner. This book is a pleasure to read.